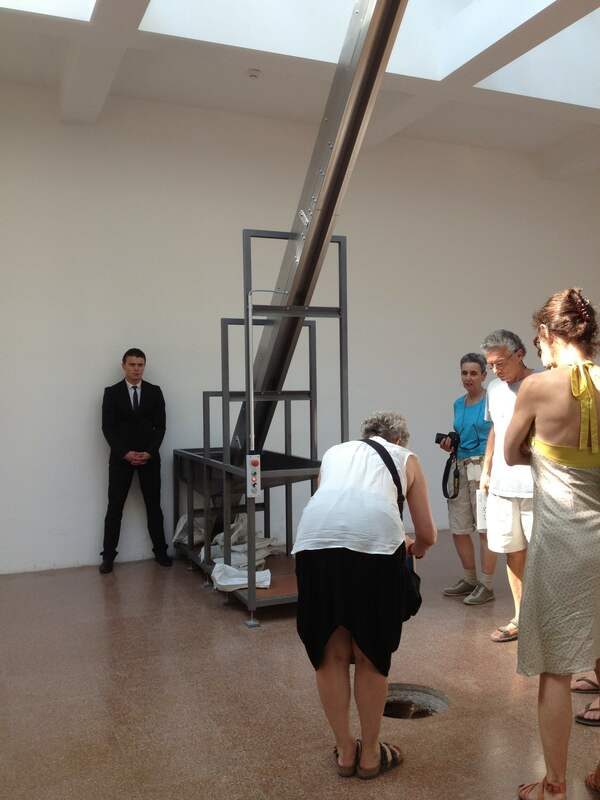 I had a wondrous museum experience at the Venice Biennale. It felt like walking through another world built by collective imagination. It played in my mind for a week afterwards. This year’s Biennale is for museum thinkers as the curator Massimiliano Gioni (usually found at New Museum in New York) takes an imaginary museum, the Encyclopedic Palace, as his conceptual touchstone. He uses the museum to explore, among many ideas, contemporary information overload, the space of the imagination and making visible that which is invisible. It lead me to thinking about wonder, the most powerful invisible force in museums. It emerges during looking and experiencing yet its triggers and inspirations are as unique as each visitor. I’ve written previously about ‘the wondrous circle of looking’ in museums. But the debate about how we look at art and in museums has progressed, still featuring the role of technology to inhibit or create experiences. Two opinion pieces sparked online discussion; Judith Dobrzynski in the New York Times worked through her perception of a lack of works encouraging quiet contemplation in art museums and James Durston of CNN explored why he’s bored by museums. The episode concluded with James Pepper Kelly’s satire of the two, though not before Dana Allen-Greil sensibly brought the conversation back to wonder. In the background, an ongoing discussion about the validity of using cameras and smartphones in museums bubbles away. The author of This Belongs in a Museum had a debate with their readers on the topic. An article amusingly grumbled about the rudeness of taking smartphone photos in busy museums the week before. A few months prior, Kenneth Goldsmith claimed visitors using smartphones are not looking at all (prompting me to create Museum Selfies). James Elkins, in an article examining our looking at high resolution art images, suggests a contemporary pathology or obsession with seeing. Are we preoccupied with how we look? Can we now say our looking is contested? Shouldn’t we be focusing on what comes from our looking? Deferring to Seb Chan, “what if we made wonderment our key performance indicator?” Can we learn how looking and experience produces wonder? What are the metrics of wonderment? How can we make this powerful but invisible force in museums visible? These questions, the debate around looking and my prolonged Biennale wonder inspired me to unpack three installations I saw in Venice. Courtney Johnston points out that it’s artists, not museums, creating experiential works which need their audiences. 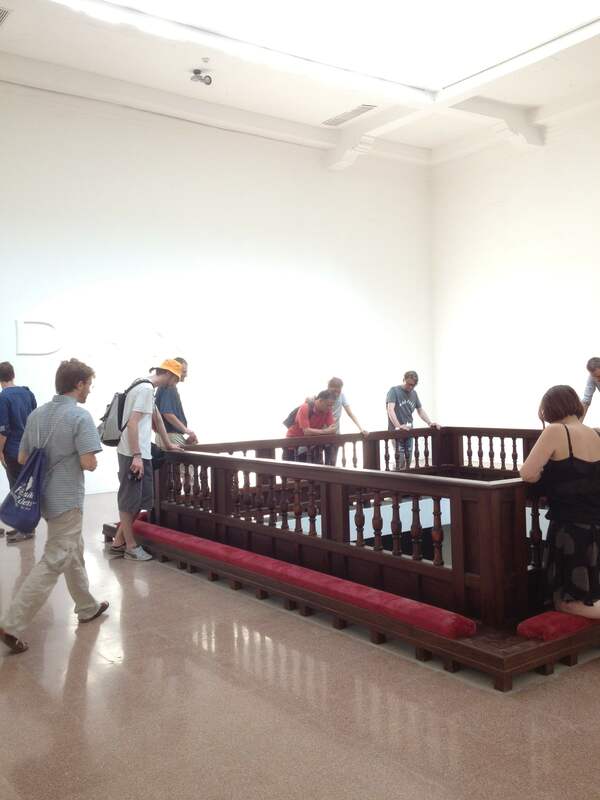 Without visitors, these Biennale installations wouldn’t function or, in one case, would not exist. They all inspired wonder in many visitors. And critically, all make space for different kinds of looking. For a complete description of this installation, see this article in Russian Art and Culture. Some women fell to their knees and scraped up handfuls of coins, embracing their role. Others held back as we realised we’d been seduced onto a stage. Without knowing the story of Danae’s seduction and impregnation by Zeus’s golden rain of coins, many visitors (including myself at the time) were mystified. 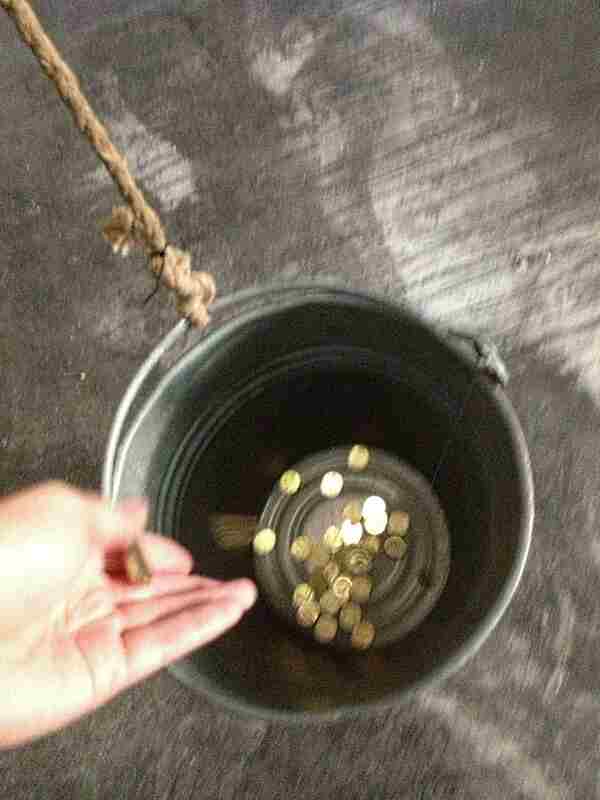 In the rooms upstairs, one suited man sat in the rafters throwing peanut shells, another stood guarding a conveyor belt which fed collected coins into a ceiling dispenser, ready for them to drop again into the lower floor. Only when entering the final of 5 rooms does the overall process become clear. Behind my marveling at the beauty, my curiosity gave way to distaste as the process and its hierarchy revealed itself. I spent a long time looking and contemplating as women enacted the ‘essential role’ of scrabbling for coins while men climbed ladders above. Participation here is not entirely sweet. Yes, I felt seduced but also a little used. The statement for this work, including a description, can be read at DesignBoom. Visitors wait outside this glass pavilion for others to sign a waiver listing risks such as panic, nausea, epilepsy, dizziness and fainting. After this, you need to remove your shoes. By this point, I had a palpable sense of both curiosity and trepidation. The artist has created a space in which to contemplate, look and experience yourself. All internal surfaces are reflective and a light-diffracting layer has been added to the external walls. 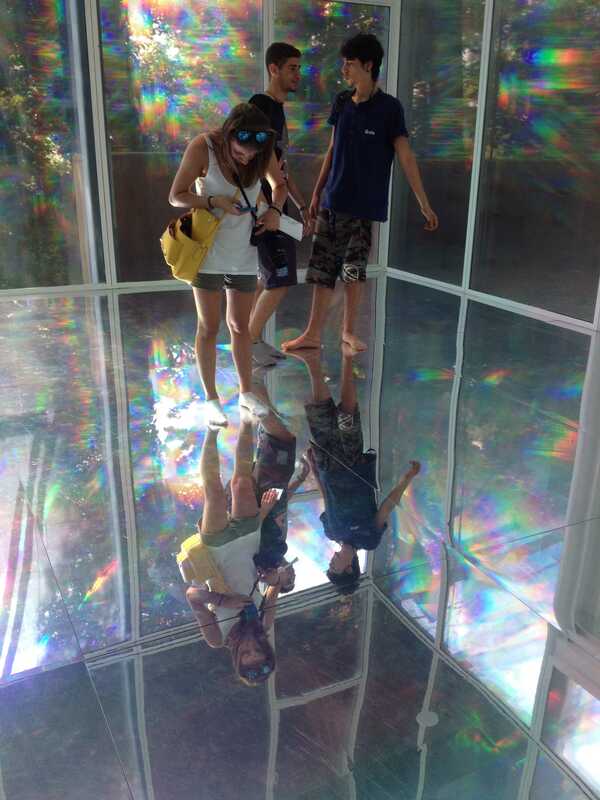 You see yourself reflected and repeated among softened light and an array of rainbow colors. Visitors become entranced, groups separate and go quiet. Smartphones come out. I found photographing others taking selfies to be a fairy-catching sport. Here, selfies are taken alone and furtively. This is a self-conscious space. You can choose to enter an anechoic chamber in the heart of this pavilion. Inside, the chamber is suffocatingly black and silent. After looking at countless reflections of myself in the mirrored spaces, I was pressed inwards. Once the residual light faded from my vision, my only sensation was of myself. Here the art is inside the visitor and is the visitor’s capacity to perceive themselves. I’m impressed by the artist’s generosity; her work is an environment for visitors, the art is transient at minimum, taken away by visitors at best. You can read a description of these works at Mousse Magazine. Visitors enter to look across life-sized heat maps of deceased animals, watching the warmth of their life leaving the corpses in real time. My looking was complicated by beauty and horror, wanting to stay and move on simultaneously. Elsewhere, contraptions attached to branches of trees moved and made noises, a physical translation of the tree processing carbon dioxide. A tree began screeching after I blew hard onto leaves caught in one contraption. I could see and hear the invisible process of photosynthesis. Nearby, a perspex box filled with dying leaves had porthole-like gills. It resembled a transparent coffin. They flipped open to release carbon dioxide when enough was produced by the leaf litter. As these dead leaves exhale carbon dioxide, the live trees gently move and squeal as they take it in. As I looked, I felt the room breathing. I felt and saw the world breathing. I felt the earth as a living animal. 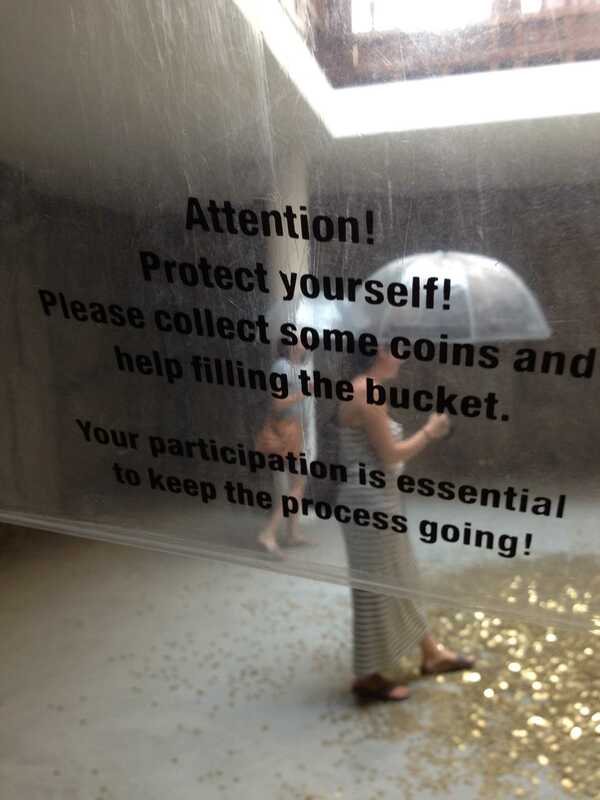 These installations, and others I saw in Venice, stayed with me for days. I woke in the mornings with memories and new thoughts inspired by one or all of them. I was experiencing prolonged wonder. As Seb Chan predicts, I tweeted my way through wonder, sharing my research online into particular pieces. Was anyone there to catch it, to measure it? Thanks to the featured artists, if wonder were a key performance indicator of the Biennale, I predict this year’s event met its target, however it might be measured. These artists have taken their audience and their diversities seriously. All three installations provide space for different types of looking and experiencing, hence more wonder was experienced by more visitors. I could see it on their faces. Contemplative visitors stood equally alongside their participating neighbors. A diversity of looking enabled more wonder. From recent articles, it might seem like visitors fall into specific camps and aren’t open to experiencing challenging art or conducting different types of looking. To being open to wonder. But I see museum visitors engaging art of all types with an admirable curiosity and receptiveness. Despite the many articles indicating otherwise, we shouldn’t underestimate our visitors. 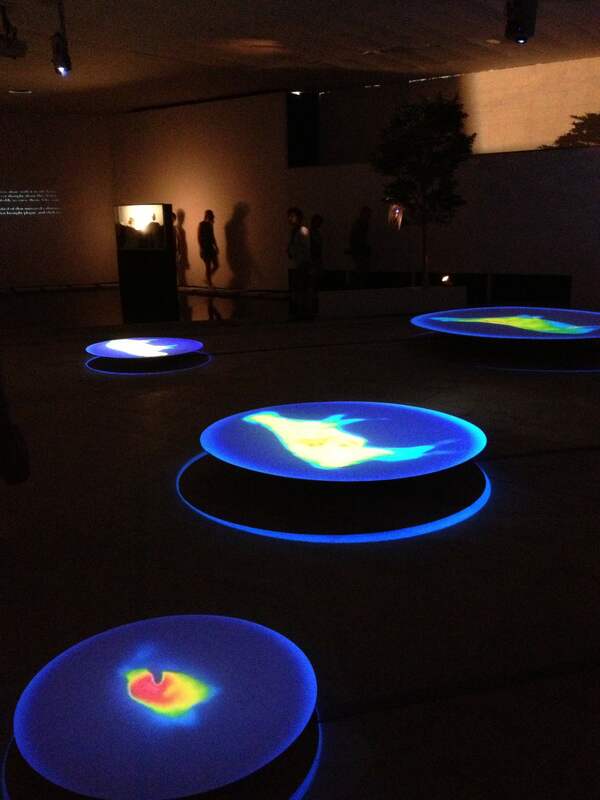 How can we measure or monitor their wonder, have any museums attempted this? Can museums shift the dialogue away from how we look to what comes from it? Can museums assist visitors to be aware of different types of looking and explore how it affects their reactions to art? What do you think? This must have been the most incredible experience. Thanks for sharing, it made for a very interesting read!